Gradshop offers the largest online selection of graduation apparel and accessories for your preschool, kindergarten, elementary, middle school, high school or university graduation. Gradshop offers affordable pricing, secure and safe ordering and options for free shipping as well as fanatical customer service. 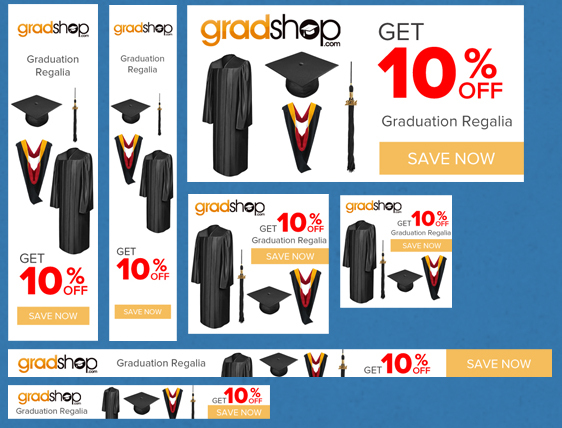 Find out why Gradshop.com has become the web's number one graduation cap and gown outfitter. There are many Gradshop affiliate links to choose from including links, banners and videos. You can choose whats best for you. What can Gradshop’s affiliate program do for me? Our Internet affiliate program can make you money. Just put a Gradshop ad or link on your blog, website or newsletter and you pocket 12% on purchases your visitors make on Gradshop.com. The best affiliate programs center on products that are highly needed like products and services in the graduation industry. It's a plus that Gradshop is recognized by most schools and students nationwide. Join Gradshop’s affiliate program –create new sources of income with very little effort and benefit teaming up with one of the largest names in the graduation industry.